If you want to record a blue whale’s song, you’re going to have to work for it. You can’t just pop into the recording studio or hold your iPhone underwater. You’re going to need a boat, some special recording equipment, a few suction cups, and a lot of patience. For more than a decade, scientists at Scripps Institute of Oceanography have had just that, and they’ve now constructed a database of more than 4,500 songs by the largest animal ever known to inhabit Earth. Their analysis, presented at the annual Ocean Science Meeting in Portland, Oregon this week, has started to shed light on blue whales’ secret underwater lives. It’s the first step toward building a baseline of how the whales behave, and how human activity might impact them as they recover after years of whaling landed them on the endangered species list. Ana Širović, an acoustics researcher at Scripps, told Earther that analyzing blue whale sounds was among the least invasive ways to monitor the whales, which made it appealing to her and her fellow researchers. They collected data from a set of passive hydrophones—essentially underwater microphones—situated around the Channel Islands off Southern California. But to get more informative data, researchers have been taking boat trips out to tag whales with special sensors since 2002. Blue whales have to surface every 10-20 minutes to catch their breath. Širović told Earther they generally aren’t bothered by humans hanging around when they surface (and why should they be, they weigh up to 190 tons), which means researchers have a short window when they’re on the surface to attach listening devices to the whales using suction cups. In the early years of the data record, the sensors merely recorded sounds and pressure, a proxy for how deep the whales were. But in recent years, they’ve had accelerometers, the same thing inside your iPhone that tells it which way you’re holding the phone. That data gives researchers clues about if the whales are singing when they’re vertical, and thus diving. Where the patience part comes in is the fact that sensors don’t stay permanently attached to the whales. Instead, they randomly pop off once the suction seal breaks. Širović said that can take anywhere from 10 minutes to 20 hours, though one of her colleagues is working on a prototype that can stay attached and collect data for up to 10 days. Some sensors connect to satellites while others send out a radio signal, but either way, researchers have to retrieve them if they want the data they collected. In some cases, the whales may have traveled as many as 100 miles from where they were tagged, meaning a long Zodiac ride to retrieve the sensor. The end result of roughly 15 years of this process has revealed new insights into whale life. The researchers found three main types of calls they dubbed A, B, and D calls. The A and B calls could also be strung together to create a song, dubbed an AB song. “We’re very original with our naming,” Širović deadpanned. To even hear the calls, researchers have to speed them up so they’re audible to humans. To the untrained ear, the blue whale’s song might sound like a haunted house soundtrack of moans and hums. But to a trained ear, these songs are a veritable gold mine. The B call is much lower pitched, and can travel further distances as a result. She’s found that, just like humans, dudes tend to talk more. Širović said it’s likely either related to mating, or males are just letting other males know they’re out there. Getting a better grip on what the different calls mean will be a research priority going forward. But the 4,500 sounds also provide an important baseline to understand how our activities affect blue whales. While there are 10,000 to 25,000 blue whales in existence now across the world, that’s only three to 11 percent of their totals in 1911. Whaling nearly drove these animals to extinction. Even though the species is in recovery, human activities still have the potential to harm them, particularly noisy ones. Most of Širović’s funding comes from the Navy, which conducts frequent exercises in the area. Her findings can help them, shipping companies, and other seafarers to understand if their work stresses out the whales. 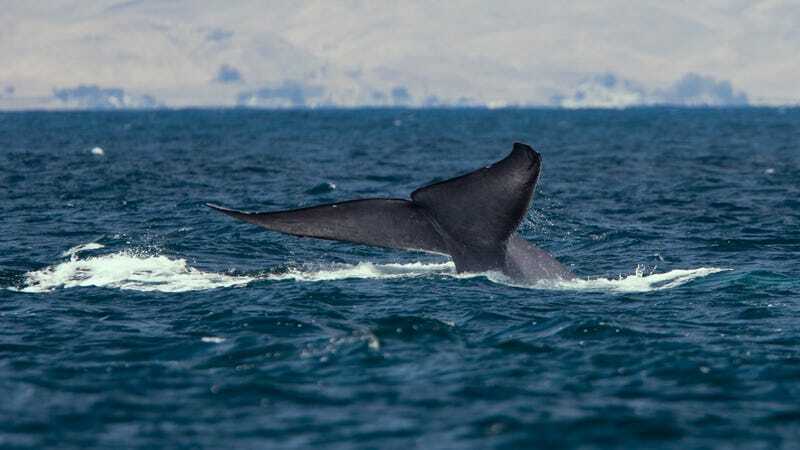 Longer term, it could help researchers better estimate the total population of blue whales off Southern California, and learn whether populations elsewhere around the world are recovering. Širović said the technique could also help them untangle the mysteries of other whale species. She’s already started on another project to analyze the finback whale, which she jokingly called “the poor, neglected little step brother of blue whale.” Their calls are distinct and will take years more to analyze, but it points to the fact that there’s a veritable undersea symphony waiting to be recorded.